Thursday February 26- 1931 I worked on Mrs Gays rug most of the day She took me to the church at 5.30 The Whetstones had been out of town all day. Ott came to the church and brought me home. sent paper to Mrs [Clute?] Friday February 27- 1930 I worked on the rug till 3.30. Then gave the rooms a good cleaning and made apple preserves to take to Elder Daughters party tomorrow. Letter from Ida I read in evening. William better tonight. 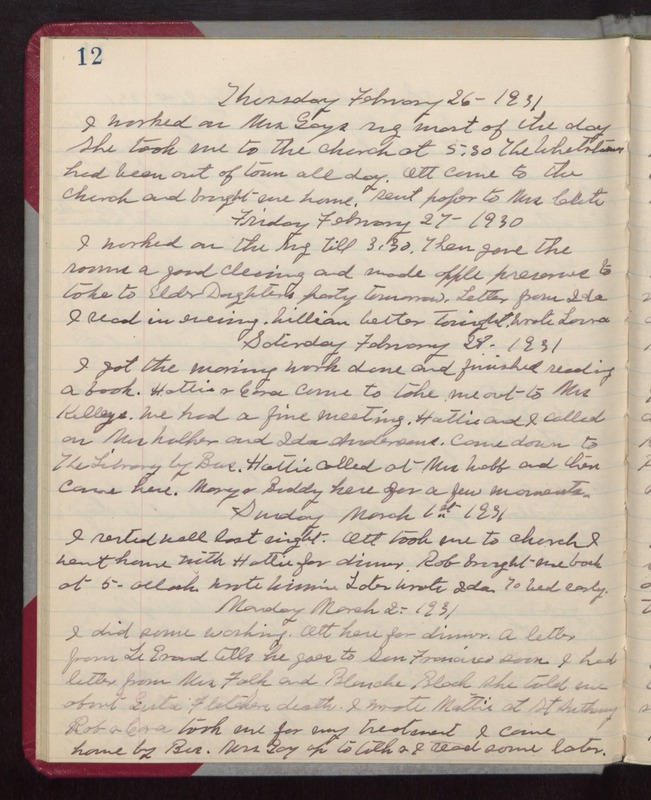 Wrote Laura Saturday February 28- 1931 I got the morning work done and finished reading a book. Hattie & Cora came to take me out to Mrs Kelleys. We had a fine meeting. Hattie and I called on Mrs Walker and Ida Andersons. Came down to The Library by Bus. Hattie called at Mrs Webb and then came here. Mary & Buddy here for a few moments. Sunday March 1st 1931 I rested well last night. Ott took me to church I went home with Hattie for dinner. Rob brought me back at 5 - oclock. Wrote Winnie Later wrote Ida. To bed early. Monday March 2- 1931 I did some washing. Ott here for dinner. A letter from LeGrand tells he goes to San Francisco soon I had letter from Mrs Falk and Blanche Black She told me about Gerta Fletchers death. I wrote Mattie at St Anthony Rob & Cora took me for my treatment I came home by Bus. Mrs Gay up to talk & I read some later.